Jacqueline Hewitt discusses how NASA's TESS exoplanet mission has already changed the institute she directs and will bring about further evolution in the years to come. The just-launched Transiting Exoplanet Survey Satellite (TESS) could soon provide the breakthrough identification of dozens of potentially habitable exoplanets right in our cosmic backyard. The now defunct Chinese space station Tiangong-1 is en route to crash into Earth – completing its "atmospheric reentry phase." Did Prehistoric 'Astronomers' Build Stonehenge? If you read the fine print of many other companies they usually say that astronomers do not officially recognize the name of the star you just purchased. UK's Astronomer Royal Martin Rees shares his memories of the late star physicist Stephen Hawking. Albert Einstein's vision for how gravity works was, to say the least, a radical departure from the older, Newtonian perspective. 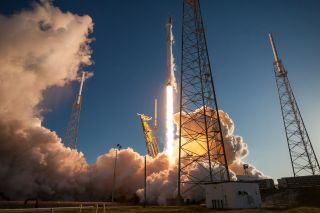 As exciting as SpaceX's Falcon Heavy launch was, we should remember that the wonders of space, with its "billions and billions" of planets and stars, are not exclusive domain of a few billionaires. To visit a truly strange land full of wonder and mystery, all you have to do is crack open your microscope case and look down, down, down. Ultradense quark stars, which mash together one of the universe's fundamental particles, may or may not be a physical possibility. We all know about powerful supernova blasts — but compared to quasars and their brighter cousins, blazars, they're peanuts. In the late 1990s, theoretical physicists uncovered a remarkable connection between two seemingly unrelated concepts in theoretical physics.